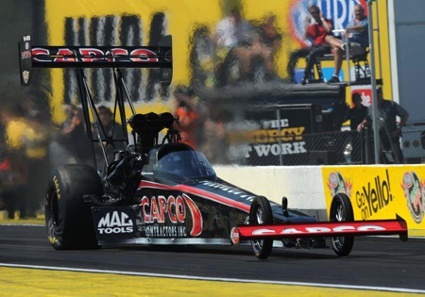 March 17, 2013 -- Steve Torrence took 3.769 seconds Sunday morning to relieve any doubts about the performance of the Torrence Racing / Capco Contractors Inc. Top Fuel dragster. That was all the time he needed to defeat Morgan Lucas in the first round of the Amalie Oil Gatornationals at Gainesville raceway. It also was the second-quickest Top Fuel time of the weekend and came three weeks after he missed the starting line-up at Phoenix. “We needed a good run,” said Torrence. “We have been working hard since then to make sure it doesn’t happen again. We were trying different things to make our car run quicker and faster. We just went with what we felt was the best combination. We had two good runs. Torrence’s speed was 326.63 mph and Lucas trailed with a 3.836 at 323.58. In the second round, reigning Top Fuel champion Anton Brown edged Torrence, 3.771 at 326.48 mph to 3.793 at 326.08. The winning time was the day’s best.